This exciting 17-day adventure takes you into some of east India's finest wildlife destinations and UNESCO Heritage Sites. Go boating in the Sundarbans, see the famed Rhinos of Kaziranga, explore Manas National Park and immerse yourself in the unique local culture of this fabulous land. Your Northeast India wildlife & cultural tour begins as you reach Kolkata where you will be received by our representative at Dum Dum Airport, and transferred to your hotel. You can spend the day relaxing or explore this Indian metropolitan city if there is time. Today we will go on a city tour of the grand metropolitan city of Kolkata. A 'Heritage Walk' will take us around the city, which has several wonderful and distinct old buildings. Some of the buildings that we will be visiting include the imposing Writer's Building, the Town Hall, St. John's Churchyard and Metcalfe Hall. We will also visit the house of Nobel Laureate Rabindranath Tagore, the Marble Palace and a number of museums. You may also want to travel in Kolkata's quaint trams, a symbol of the days gone by. In the morning, we set out through the beautiful countryside for the jetty at Sonakhali. We will be greeted with a refreshing cup of tea by our local guide, who will brief us on what lies ahead for the day. After the briefing, we will go on a 2 hour cruise in a motorized boat through the Hogol, Gomor, Durgaduani and Gumdi rivers. 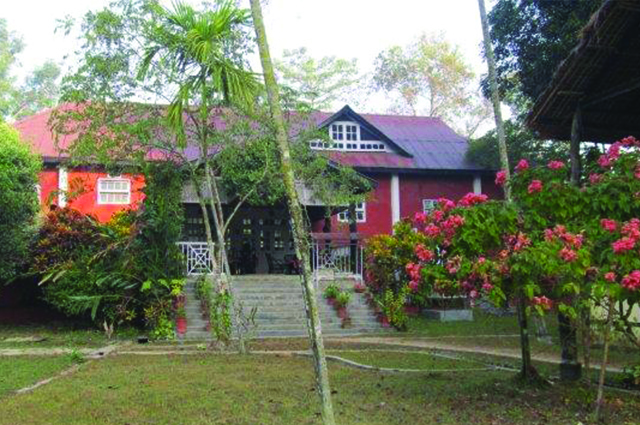 An optional stopover can be made at Gosaba, one of the earliest human settlements in the Sundarbans, to visit the house of Sir Danniel Hamilton. He was a Scottish banker who started the first co-operative movement in India. We arrive at Bali Island around lunch time and check into Sunderbans Jungle Camp, our accommodation for the next few nights. After lunch, we leave for a 3-hour Birdwatching and Game Cruise to Sudhanyakhali Watchtower in the Sundarabans. As we go through the area's creeks and canals, keep an eye out for the the elusive Tiger. We might also spot Monkeys, Dolphins, Otters and other animals that inhabit this region. After our cruise, we will return to the camp in the evening. Sundarbans is well-known as a tiger reserve, and is one of the largest of its kind. It is also a Biosphere Reserve and has the distinction of being a UNESCO World Heritage Site. The Sundarbans is home to more than 400 tigers. In addition, other animals like Fishing Cats, Macaques, Wild Boars, Foxes, Flying Foxes, Pangolins, Crocodiles and Gangetic Dolphins can be seen here as well. Our first full day in the Sundarbans will start after breakfast. We will go on a birdwatching and game cruise to Netidhopani Watchtower (subject to favorable weather conditions) in country boats. You can try your hand at fishing and crab catching. Lunch will be served on board. We return to the camp in the evening and you will have the opportunity to experience a local rural theatre performance. This form of theatre, known as Bonobibi Yatra tells the fascinating story (with a good deal of song and dance!) of the Tiger Lord, the forest gods and goddesses, fishermen and honey collectors. Today, after breakfast we go on a guided Village Walk, which will give you a glimpse of the region’s culture. Interact with the villagers and learn about their lifestyle, art and cuisine. You might also want to see the indigenous farming and household implements that they use. This will be followed by a guided cruise in a country boat with oars, which will enable you to enjoy the splendor of the Sundarbans at a leisurely pace. You will have to do a fair bit of travelling today! After breakfast, we head for Kolkata Airport to catch a flight to Guwahati. You will be met on arrival at Guwahati and driven through rural Assam to Manas Tiger Reserve (approx 4 hours drive). Manas Wildife Sanctuary is a UNESCO World Heritage Site. It is home to a rich variety of wildlife that includes the Tiger, Pygmy Hog, Indian Rhinoceros and Indian Elephant. Manas is also famous for birds such as the Bengal Florican. Our accommodation here is Manas Jungle Camp. It is run by the Manas Maozigendri Ecotourism Society that was formed by the local Bodo conservators who are instrumental in Manas’ conservation. We will be greeted by our hosts with a short traditional ceremony, after which our local guide will brief us about the tour. We leave in the morning on a day-long wildlife expedition in Manas with the conservation team. Today we will explore the Eastern Core of Manas and also visit the park’s patrolling camps and conservation centers. We return to our camp in the evening, where we will be served tea and have an ‘infotainment’ session with one of the conservation project coordinators. For dinner, we might get to enjoy local cooking that uses ingredients from the village’s unique organic farm. Today we will set out in the morning once again on a day-long wildlife tour of Manas. A local conservator and naturalist will lead this exploration. Picnic lunch will be served. We return to our camp in the evening, where we will get to enjoy a local cultural program (Bagrumba) performed by the villagers. Through the medium of dance and song, we will be told the interesting story of the local Bodos and their long association with Manas and its wilderness. Today, after breakfast we go on a guided Village Walk, which will give you an idea of the region’s culture. Interact with the villagers and learn about their lifestyle, art and cuisine. You might even get to find out about a unique regional beverage- rice beer, and enjoy a bullock cart ride! This will be followed by a guided cruise in a banana boat with oars, which will enable you to enjoy the splendor of the area at a leisurely pace. On this 10th day of the tour, we bid goodbye to Manas and travel for 7 hours along a picturesque route to Kaziranga National Park. Kaziranga is a UNESCO World Heritage Site. This 470 sq. km. national park has tall elephant grass and lush green flood plains, and is home to a rich variety of wildlife. 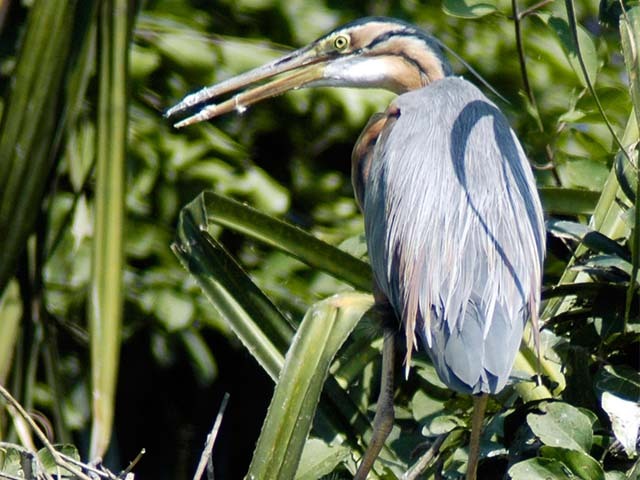 Here you might spot birds like Greater Adjutants, Bengal Floricans, Pallas’s Fish Eagles and black-necked Storks. Kaziranga’s larger inhabitants include the Greater Asian one-horned Rhinoceros, Asian Elephant, Asiatic Water Buffalo and the majestic Royal Bengal Tiger. Another packed day in Kaziranga! 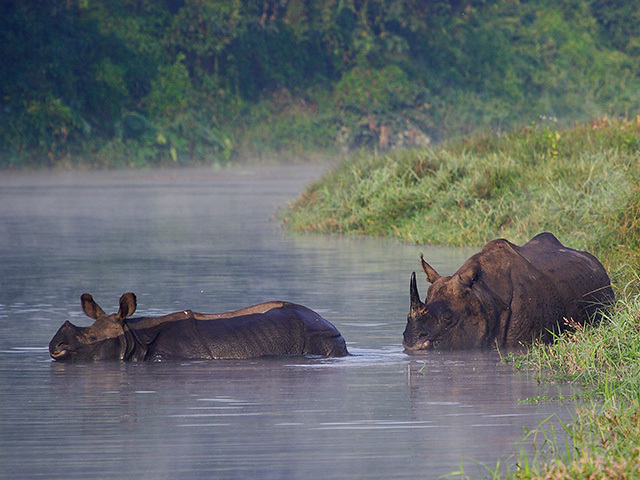 We leave early in the morning to explore the wilderness of Kaziranga’s Central and Western Ranges. We will get to go on an Elephant safari (approx 45 Min). We will return to the resort for breakfast, and set out once again for a game drive in an open vehicle. Another game drive is scheduled for after lunch. An early morning Elephant safari will be followed by a game drive in Kaziranga National Park. We return to the resort around noon. In the later part of the afternoon, we will make a short trip to Bhomoraguri and enjoy a sunset cruise on the Brahmaputra river. We will go on our last game drive and head for Guwahati after lunch. The remaining part of the day can be spent as you wish. Today we will go on a Guwahati day tour. Among our stops is the Kamakshya Shakti Temple- one of the prominent Shakti sites and Tantrik Hindu pilgrimage centers of India. The temple is at the top of Nilachal hill, from where one can enjoy a spectacular view of the city and the Brahmaputra. In the temple, you may be allowed to venture close to the Sanctum Sanctorium (entry is restricted) to observe the ceremonial Puja (worship). From here, we will drive 32 kms to Sualkuchi, the famous silk village. The local community here have been engaged in silk weaving for generations. We will get to observe how this fine material is woven and turned into something of great beauty. Packed lunch will be served during a break in the journey, after which we return to Guwahati. You are free to spend the afternoon as you wish. You may want to visit the local handicrafts emporium, which sells a wide range of Assamese art and craft. Today we head for the airport to catch a flight back to Kolkata. Our representative will receive you and transfer you to the hotel upon arrival at Kolkata airport. You can spend the day relaxing or explore the city if there is time. This is the last day of your Northeast India wildlife holiday and you will be transferred to the airport for your flight back home.